Life as a Jane Doe: it's a sad day for the clemson tigers & chicago bears. it's a sad day for the clemson tigers & chicago bears. 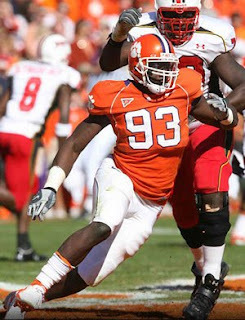 One of Clemson's best players of all time, Gaines Adams, died this morning at the age of 26 from cardiac arrest. He had an enlarged heart that his family nor medical examiners knew about. He currently played for the Chicago Bears. "For Adams' senior year, 2006, he was slated to be among the best defensive ends in the college football. Adams lived up to his reputation by starting all 12 games, recording 12.5 sacks,causing 2 fumbles and recovering 3. By the end of the 2006 season, Adams recorded a total of 28 career sacks, tying the school record set by Michael Dean Perry (1984–1987). In addition, Adams was named to all five official All-America teams acknowledged by the NCAA in 2006, one of seven unanimous All-Americans that year." You will be missed, Gaines.